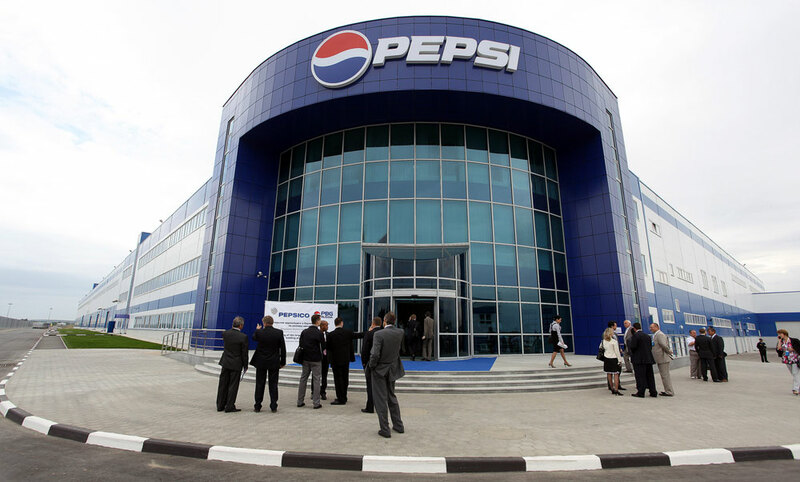 The view of PepsiCo beverage facility in Domodedovo, Moscow Region. PepsiCo invested $9 billion in Russia. Commodity turnover between Russia and the U.S. has declined by 50 percent since the introduction of sanctions However, Russia is not losing hope and is offering attractive conditions for small and medium-sized American businesses looking to invest in the country. With the introduction of sanctions, trade and economic relations between Russia and the United States have practically been frozen: By the end of 2015 commodity turnover between Russia and the U.S. had decreased by 27.9 percent to $21 billion. And in comparison to the maximum figures from 2011 ($42 billion), turnover has fallen by 50 percent. First Deputy Minister of Economic Development Alexei Likhachev presented the information on April 15 at a briefing dedicated to bilateral trade and economic relations. The Ministry of Economic Development admits that geopolitics and the macroeconomic situation have seriously affected trade statistics. Direct interministerial contacts between Russia and the U.S. concerning trade and economic relations are frozen, while Russia's interactivity with the U.S. Ministry of Trade takes place only within the WTO, said Likhachev. The American Chamber of Commerce in Russia has confirmed the state of affairs, with head Alexis Rodzianko telling RBTH that American business has been directly and indirectly prohibited from investing in Russia and doing business there. However, according to Likhachev, Russia is willing to meet America half-way. "We do not perceive the current situation as the shutting down of trade and economic relations with the U.S. We are ready not only to continue cooperation but also increase it," he said. He added that the main challenge this year is to "avoid the point of no return." And here the deputy minister spoke of the risk of losing America's small and medium business as partners. "There are medium-sized companies, family companies for example, that still produce things. It is difficult for them to adapt to complex conditions, but they are no less important for the economy than large corporations," he said. Despite the general cooling in relations between the countries, there are individual examples of new successful joint business projects (American investments in Russia in the third quarter of 2015 amounted to $212 million). In total there are almost 3,000 American companies in Russia, and the U.S. is also the leader in terms of foreign companies in Special Economic Zones, with 11 projects. There are new projects as well. For example, Emerson has invested $40 million in a structure that develops and produces measuring instruments and automation systems, while Trammo Group has invested $10 million in a joint enterprise that produces granular sulfate ammonia. Another two significant American projects are Armstrong's production of ceiling panels made of mineral fiber (a $60 million investment) and the contracts to assemble Bell helicopters at the Urals Civil Aviation Plant. The Russian Ministry of Economic Development estimates the total volume of direct U.S. investments in Russia's economy at over $6 billion. However, Alexis Rodzianko believes that the statistics do not take into consideration the actual participation of American business in Russia, which is why in reality the figure could be much higher. According to Rodzianko, American companies have been working through other countries for a long time – they have become transnational – therefore for them it is not difficult to enter Russia through a third country. "For example, many Russians have Apple iPhones and iPads, but in trade statistics they are registered as a Chinese export, since they are produced there. Another example is PepsiCo, which invested $9 billion in Russia, but physically the money entered Russia from another country, through the Netherlands. These facts must also be taken into consideration," said Rodzianko. However, while large companies are capable of solving their problems by themselves, small and medium American businesses can seldom overcome political barriers. In order to facilitate the penetration of the Russian market by this segment, Moscow has taken some targeted steps. For example, since 2015 foreign entrepreneurs have been able to establish small and medium-sized businesses in Russia (with annual revenues of up to $11.8 million) and on equal terms with Russian businesses apply for state aid and benefits: single tax, subsidies for credit rates. Foreign share in a company can now be up to 49 percent (before it was 25 percent). "We have basically equated small and medium businesses [SMBs] in terms of opportunity for attracting state assistance independently of who is the founder," said Likhachev. This is extremely important since support for SMBs is one of the most crucial parts of Russia’s anti-crisis plan. This year 11.1 billion rubles ($166.6 million) has been allotted for these objectives. Another important instrument for creating favorable conditions for these businesses is the so-called "special-invest-contract," introduced this year, a new type of contract for foreign investors who wish to open localized production in Russia. Each contract is stipulated individually: The higher the level of localization, the more benefits the investor will receive. The first "special-invest-contract" is expected to be signed with Claas, the German agricultural technology producer, which has been operating in Russia for more than 10 years. "There is now the opportunity to create exclusive conditions for this company to realize its project, conditions that the company needs. It can receive incentives for the next 10 years," said Likhachev. The American Chamber of Commerce says that in such conditions American companies would be particularly interested in the Russian agricultural sector. "This is a quickly growing, high-tech field and Russia is a big reserve for global food production," said Alexis Rodzianko. In turn, Alexander Likhachev noted the great potential of the Far East for business from America's west coast, which for now is not in significant demand. "This region could become a real goldmine for American businesses," he said.